These are the tools you need to turn beautiful separated balls like those found in Woodturning Wizardry. 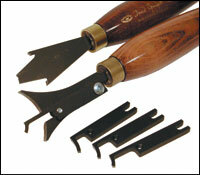 The set consists of one Profile tool for cutting the holes and one internal circle cutting tool with four cutters. These tools can also be used to produce many other intriguing pieces such as cubes in spheres, spiked stars in spheres, and lidded boxes containing spheres. General instructions by David Springett are included with the set of tools.